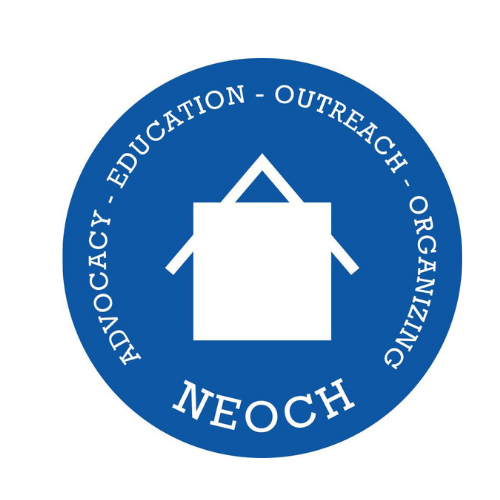 NEOCH: Since 1988, we have sought to break the cycle of homelessness in Northeast Ohio. We organize and empower homeless and at-risk men, women and children through public education, advocacy, and the creation of nurturing environments. We seek to be responsive to the needs of unhoused people in Northeast Ohio by affirming their dignity. Our main programs seek to amplify the voice of those experiencing homelessness through advocacy, outreach and education. We do this through our Homeless Congress, monthly meetings for people experiencing homelessness. Coordinating the Cuyahoga Affordable Housing Alliance, a monthly meeting with housing leaders to promote affordable housing policies. Publishing the Street Chronicle, a newspaper written and distributed by individuals experiencing homelessness and the Outreach Collaborative where we coordinate homeless outreach workers to help the homeless access resources. We envision a society without homelessness. We know reaching this goal begins with pushing society, particularly service providers and the government, to treat people experiencing homelessness with dignity and respect. The homeless need better shelter standards, more county support, more accessible housing, and –most importantly– more chances to have their input heeded. Job Summary: The Northeast Ohio Coalition for the Homeless is seeking a dynamic individual who supports our mission to end homelessness, has excellent technical writing skills, very detail-oriented, and can work effectively with a team and individually. This position is in collaboration with Think-Tank Inc. The Community Engagement Specialist-AmeriCorps VISTA will work to build capacity within the organization by improving community engagement mechanism, organizing events, and develop leadership to further affordable housing in our community. They will collaborate with NEOCH staff toward these goals. · Organize our annual event to increase economic support and network participation by developing a leadership committee, marketing material, recruit sponsorships and volunteers. They will help with logistics on the day of the event and assist in data collections, analysis, and follow up. · Research the history of housing policy in the Cleveland community and through strategic conversation gain an understanding of challenges and opportunities as it relates to housing issues on impacted communities to build partners for implementation of the Housing Cohort program. · Work as part of a team to secure a successful program through developing schedules and charting logistics, help with setup, breakdown for classes and procuring speakers to teach the classes for the program. · Work to improve current system of management and outreach to members and supporters through reviewing and evaluating our existing system, understanding the needs of the organization, and designing an internal process that will improve our membership communication and participation. · Attend all trainings as needed by the program in collaboration with Think-Tank Inc..
· Bachelor’s degree (or equivalent work experience) in community organizing, social work, urban studies, human services, non-profit administration, communications or related field. · Proficiency in computer and web-based information technologies and in preparing written reports and business correspondence. Able to build rapport and relationships in community and institutional settings. · Commitment to personal and community empowerment. · Possess a creative, and solution-oriented approach to issues. · Strong planning and organizational skills and the ability to think strategically in the design and execution of projects. · The ability to facilitate and engage with a diverse community and collaborate for effective solutions. · Ability to communicate and work with people of all racial, ethnic and income backgrounds. · Self-motivation and an ability to work toward objectives and ability to work independently. Able to operate in a network-centric environment, one that values interdependence and a belief that all people have gifts and are valuable. · belief in the principles of self-determination, social justice and equity. VISTAs will receive the cost of living in their area. This works out to be $1026 dollars monthly before taxes. The amount varies depending on if the service site is in a rural location versus urban. Furthermore, NEOCH’s VISTA will also receive a $2,400 ($200 x12) Housing stipend. End of Service Stipend: if not choosing education award, the stipend accrues at the rate of $125 per month for 12 months, which is $1,800 at the end of service. This award is in the amount equivalent to the Federal Pell Grant, which is about $6,059. There are two types of education benefits to members who choose the AmeriCorps Education Award: An education award in the form of a voucher (it is not cash) that can be used to pay for higher education (degree or nondegree) or to repay eligible student loans. A postponement of payments on federal student loans during the time served in AmeriCorps VISTA (called a forbearance). Relocation Allowance: Members serving a 12-month term and moving from their home of record to their project site are eligible to receive a relocation allowance. The amount which may not exceed $550. Health Care: The Affordable Care Act (ACA) reformed healthcare in the United States to ensure that essential health benefits are available to Americans through state and federal Health Insurance Marketplaces. The AmeriCorps VISTA program offers two healthcare benefits options to members, one for VISTA members who already have health insurance coverage and the other for those who do not.